I am the sort of person that goes one place for a facial, another for waxing and somewhere else for a massage but I’m starting to find out there are a few places (not many) that you can get all of these treatments done at a good standard in one place. 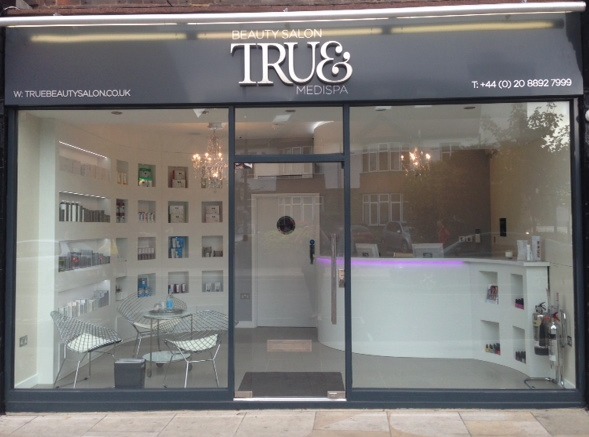 I kept hearing good things about True Beauty Salon & Medi-Spa in Twickenham and their range of facials and peels, IPL, waxing, massages, body wraps and manicures / pedicures. You can even get packages, like the 2 1/2 hr pre holiday package to get you groomed before you go away or a monthly maintenance package of a massage, facial, manicure and half leg wax. Think of all the time you will save by not having to travel to different beauty salons! Bianca Gascoyne recently cut the ribbon to declare the salon officially open and in the past month it’s already been visited by bloggers, journalists and models – people that are used to having regular beauty treatments. In that time, I’ve only had good things said about it. It was even voted the Most Loved Business in Richmond Upon Thames in 2014. The salon itself is beautiful with huge windows and lots of white and perspex, but there was the right balance of professional and medical with cosy soft furnishings. I sort of knew this from one of the photos I saw of Bianca Gascoyne on the launch night (see below) and it definitely lived up to my expectations. As I am still suffering from running the Istanbul marathon, the treatment I was most keen to try was the 60-minute full body massage. This was the beautiful bed I got to lie on, which was a very nice start. The therapist was very accommodating to my needs. I said I needed her to focus on my upper back (because writing all these blogs means I develop tension in my shoulders from hunching over my laptop) and the backs of my legs (as my calves knotted up during the marathon). I said I wasn’t interested in lying on my front or having anything relaxing and would prefer firm strokes and deep tissue massage and she nodded and got straight to it. If you need to see evidence look at how laid back I am in the photo below taken after my treatment. 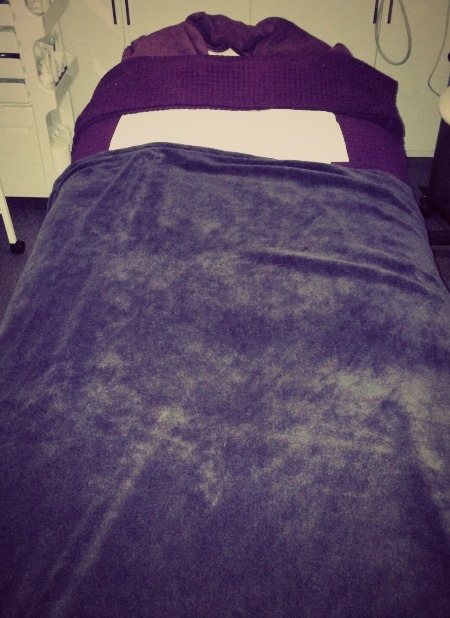 I sometimes think that massages are the hardest services for a small salon to get right as I normally go to a sports masseuse, but I didn’t feel this was inferior, If they can do a hard treatment like a massage with this much skill and care, I would trust them to do a facial and waxing too. I think I’d better go back and test it, don’t you? If you’re close to the Twickenham area, I highly recommend it. It’s obvious why it’s won so many awards! Visit the True Beauty Salon website for details of treatments and booking information.